This article explains how to optimize your code when running an ML.NET model on an ASP.NET Core WebAPI service. The code would be very similar when running it on an ASP.NET Core MVC or Razor web app, too. Eventually, this kind of optimized code might be provided as an .NET Core Integration Package comparable to integration packages targeting Entity Framework, SignalR, etc. so it’ll be transparent and a lot easier for you. However, as of today (March 2019 with ML.NET 0.11 Preview), you can make the following implementation which, once done, is encapsulated in a single class that you can very easily re-use across your ASP.NET Core projects. ML.NET model used: The ML.NET model used in this example is the model you can train/create with the Sentiment Analysis Getting Started sample. But for your convenience, that model is already serialized as a .zip file and already available in this sample code which only focuses on how to better run/score a model in scalable apps. If the provided text in the URL ‘sentimentText’ parameter was rude, then the % of toxicity would be he high. That’s it. Very simple. A single line. The object _modelEngine will be injected into your WebAPI controller’s constructor or into your custom class, so you just need to use it. Internally, it will be optimized so the object dependencies are cached and shared across Http requests with minimized overhead when creating those objects. ASP.NET Core services and apps are multithreaded applications so they can serve many HTTP requests at the same time. .NET Core provides a managed thread pool that is managed by the system. As a developer, you don’t need to deal with the thread management. As shown in the simplified image below, and ASP.NET Core WebAPI or web app accepts many Http requests which will be handled by that thread pool. The specifics of the architecture are not exactly the same if you deploy your application into IIS or selfhosted by using Kestrel, but those differences are not important in this case. The bottom line here is that when writing code for a multithreaded application such as ASP.NET Core services or apps your code and objects used in your code need to be thread-safe if the same object is going to be shared across multiple threads while updating data in-memory. The reason is because if you update data within the same shared object from multiple threads, those multiple threads can access to the same address space at the same time. So, they can write to the exact same memory location at the same time causing data corruption and application mal-function. A code is called thread-safe if it is being called from multiple threads concurrently without the breaking of functionalities. However, issues can happen if you share objects across threads, for example by using static member variables or singleton lifetime objects in Dependency Injection, as explained later on in this post. This code looks very atraightforward and simple to use. If you just copy that code and run it on any application (console, desktop, web, etc.) it’ll work okay. However, the lines of code marked with (*Expensive*) in the comments are object instantiations that are significantly ‘expensive’, meaning that it takes significant time to execute such as a few hundred miliseconds per each call if usign small models (i.e. half a second), but that can increase significantly depending on the size of the ML model. As you would initially think, improving that execution for a multi-threaded application that will run multiple predictions could be as simple as ‘caching’ the ML model (ITransformer) object and the PredictionEngine object, so those objects are instantiaated just once and shared across the upcoming requests, right? Therefore, the first optimization you could do would be to cache in memory the ML model object that you loaded from the .zip file, so it can be re-used across many Http requests. Since the ML model (ITransformer) object is thread-safe, this is not an issue and can be done very easily. 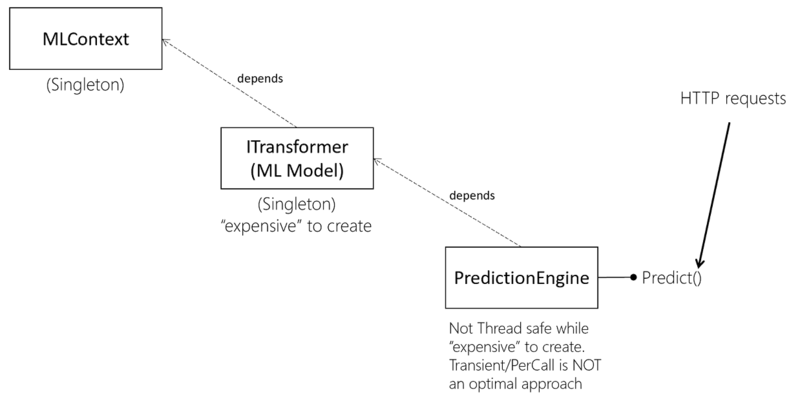 //ML Model (ITransformed) created as singleton for the whole ASP.NET Core app. Loads from .zip file here. If later on, you create a PredictionEngine object whenever you need to call predictionEngine.Predict(), either by explicitely creating it with new or registering it as Transient lifetime, that would be safe in ASP.NET Core. However, you can do a lot better because with that initial approach it won’t be fully optimized since whenever you get an Http request you’ll be creating a new PredictionEngine object which, as previously mentioned, is also a pretty ‘expensive’ operation for scalable applications. For achieving better performance in your application when predicting simultaneosuly from multiple threads (like when you handle multiple Http requests from many users) you will need, somehow, to cache the PredictionEngine object. But as mentioned, there are important caveats and problems here to solve. This approach requires some more coding and complexity (Object Pooling) for several reasons. So, before talking about its design and related implementation, let’s talk about the problem to solve. The problem when running/scoring an ML.NET model in multi-threaded applications comes when you want to do single predictions with the PredictionEngine object and you want to cache that object (i.e. as Singleton) so it is being reused by multiple Http requests (therefore it would be accessed by multiple threads). That’s is a problem because the Prediction Engine is not thread-safe (ML.NET issue, Nov 2018). If you register the Prediction Engine object as Singleton or Static, you will get into trouble because it is not thread-safe. You could then think, okay, let’s make it static while thread-safe with the [ThreadStatic] attribute? – Well, using the [ThreadStatic] attribute in ASP.NET apps is pretty dangerous. It might initially look that it is working, but write some async code (async/await) in your code and it’ll probably stop working. 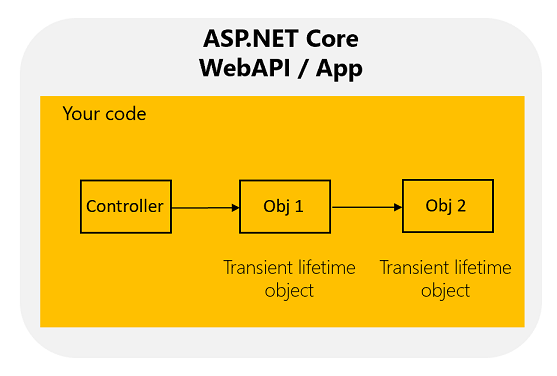 Also, the mainstream approach for object’s lifetime in ASP.NET Core is to use DI (Dependency Injection). Using static objects usage sometimes and DI other times would be very confusing, as well. If you want to learn more about it, see this discussion with David Fowler recommending not to use [ThreadStatic] in ASP.NET Core apps. Other possible approaches could be to use multi-threading synchronization primitives such as critical sections, locks, mutex, etc., but those locks would create a bottleneck in your code which won’t be optimized for high-scalable scenarios. Since a PredictionEngine object cannot be singleton because it is not ‘thread safe’, a good solution for being able to have ‘ready to use’ PredictionEngine objects is to use an object pooling-based approach. 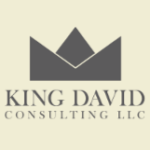 When it is necessary to work with a number of objects that are particularly expensive to instantiate and each object is only needed for a short period of time, the performance of an entire application may be adversely affected. This issue will happen if you instantiate a Prediction Engine object whenever you get an Http request. An object pool design pattern can be very effective in such cases. The object pool pattern is a design pattern that uses a set of initialized objects kept ready to use (a ‘pool’) rather than allocating and destroying them on demand. This ‘pooling strategy; is also applicable to othe ‘expensive creation resources’ like database connections and connection pool solution. The solution’s implementation is based on a higher level class (named MLModelEngine) which is instantiated as singleton and creates the needed infrastructure for such an object pool solution, as shown in the following diagram. ITransformer member object. This is the ML model. ObjectPool<PredictionEngine> member object: Object Pool of PredictionEngine objects. The ObjectPool is singleton, but each PredictionEngine within the pool will only be used by one thread when needed, then will be returned to the pool when the prediction is done. /// Exposing the ML model allowing additional ITransformer operations such as Bulk predictions', etc. What’s related to the MLContext and ITransformer objects is pretty straightforward. The ‘special code’ here is related to the Object Pool. The implementation of the object pool is not using a custom object pool approach but an official class provided by Microsoft in the Microsoft.Extensions.ObjectPool namespace which is part of .NET Core. Meaning an object pool of PredictionEngine objects using generics so you can provide your particular SampleObservation and SamplePrediction data classes. Basically, whenever the Predict() method is called, you take a PredictionEngine from the pool, use it to predict and then return it to the pool so it is available for any upcoming request. If there’s not any PredictionEngine object available in the pool (that will happen the first time you use the pool or if under pressure with many Http requests), then the pool needs to create a PredictionEngine object. Since we need the filepath pointing to the model’s .ZIP, we’re using a lambda function as a factory to be able to provide that info to the constructor. Using the injected MLModelEngine object from your WebAPI controllers to make predictions is very simple. First, the MLModelEngine object is injected in the controller’s constructor. // GET api/predictor/sentimentprediction?sentimentText=ML.NET is awesome! With that, we achieved our original goal of ‘making super simple to predict with an ML.NET model while having good performance in scalable ASP.NET Core apps’ thanks to the explained optimizations. 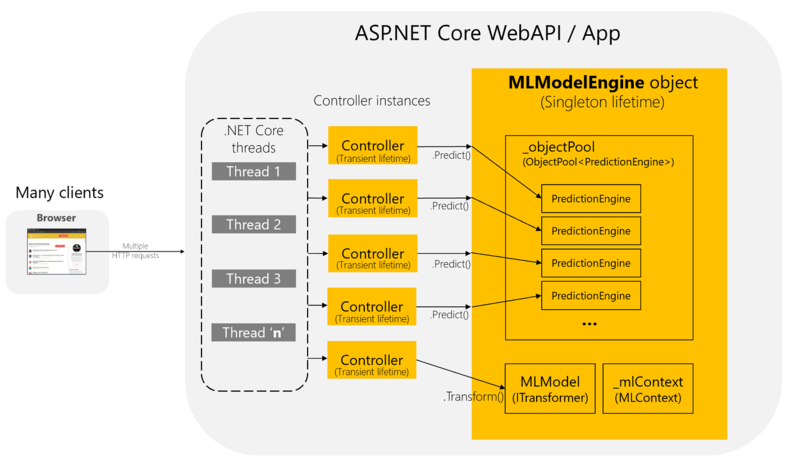 To recap, here’s a high level end-to-end architecture diagram of the Web API using the MLModelEngine with the Object Pool of PredictionEngine objects. Feel free to provide your feedback if you implement this approach in your end-user applications. Great utilization of ObjectPool! Thank for a very helpful article.